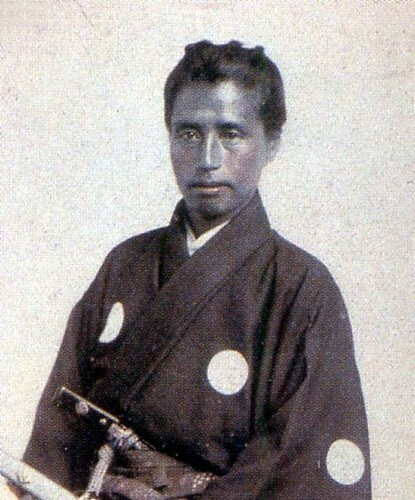 Kaishu Katsu pictured above was a late Edo period Bakufu government samurai who, with the approach of the Meiji restoration revolutionary forces, successfully argued for the surrender (or "opening") of Edo castle. When the famous contemporary intellectual Yukichi Fukuzawa (who appears on 10,000 yen notes) criticised Katsu for a lack of stoic loyalty, which Fukuzawa felt he should have held onto, even in the face of defeat, Katsu responded with the following poem. He went on to lead the Japanese navy and become one of the most successful statesmen of the Meiji period. Hiroshi Nakata's poem "the most precious thing" which appeared in his "Miracle" poem collection appears to be a homage to Katsu's earlier work. But only in the things we've done. Image from Katsu Japanese language wikipedia page.